Ok, so I saw this in the shops when it first came out and was definitely intrigued, to the point that it seemed too good to be true that you could create intricate nail art just from painting a layer on top of your nail colour. I didn’t buy it straight away as at Â£3.99 I didn’t want to waste money on something that I was not convinced about. I needed cheering up this week though, so I grabbed a bottle before they sold out again at the local Superdrug. We were so interested in it at work that we put it on one of our friends straight away and it looked awful, not sure if it was the bright red underneath or the fact that her nails were short, but in the first instance it just look like she had been digging in soil or playing with charcoal. 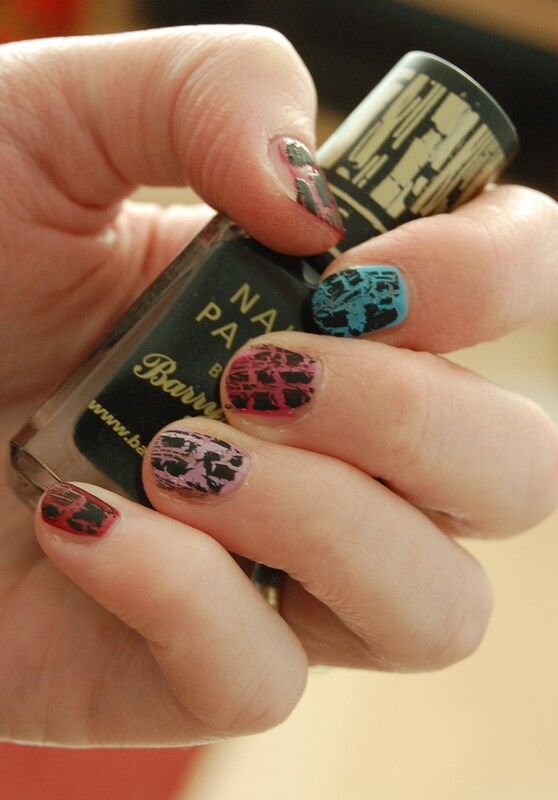 Nonetheless, it’s very clever how it works, you simply apply a colour of your choice, and let it dry and then paint one coat of the Barry M Instant Nail Effects over the top, without overlapping the black liquid and instantly it crackles into interesting patterns. For anyone who is interested, I used all Barry M Nail Pain Colours in: Fuschia 302, Berry Ice Cream 308, Turquoise 295 and Raspberry 273. The product was very easy to apply, but from the finished results, I’m not convinced it’s worth the money, perhaps it is just that it is not my style? Perhaps it would be improved with some clear gloss over the top? Worth a play I would say but not worth the hype.